When this book was originally published in 1976, video represented a new instrument, a new medium, and a new field of research with largely unrealized potential. The video-taperecorder was an addition to the technology of mass communications, a handy gadget for recording synchronized images and sound on magnetic tapes for storage or simultaneous playback. But the authors of this study look at it as also mirror, relay and catalyst, offering creative possibilities of exploration and criticism, of active analysis and transformation, of self-discovery and communication. They discern a liberating potential of video an antidote to the dominance of centralized TV in consumer society and ultimately a means towards the progressive social reappropriation of the media of communication. The authors draw on their experience working with school-children, teenagers, and a variety of cultural, political and community groups to illustrate the versatility of video in approaching diverse situations of everyday life, whether from the viewpoint of ‘cultural animation’, sociological research, or a surrealistic game. 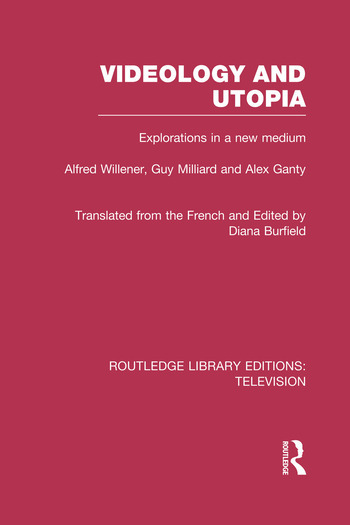 These projects, and interviews with other practitioners, present here the basis for a first typology of styles and approaches in using video, and for a ‘videology’: a language, a set of concepts, and a theory comprehending process and praxis, image and action. This is a fascinating snapshot now, looking back at these early ideas.